After watching cookingwithdog's Hoto Noodles, I was inspired to make a miso soup with Kabocha (Japanese Pumpkin/Squash) and Somen noodles!!! You can also substitute Somen noodles with Udon noodles! 1. Scoop out the seeds of Kabocha, wash (you don't have to drain well), place it on a microwavable dish, cover with plastic wrap, and microwave on medium (500W) for 3 minutes to make it easier to cut. Cut the Kabocha into bite-size pieces. 2. Slice the onion. Remove tough base of Shimeji mushrooms and break into bite-sized chunks. 3. 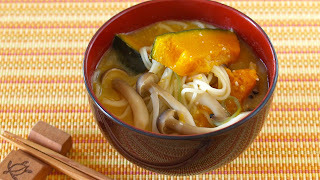 In a large pot, put the water, dashi powder, sliced onion, shimeji mushrooms, and Kabocha. Then bring to a boil. 4. Remove the foam, then cover and cook for about 7 minutes on low heat until cooked through. 5. Meanwhile, boil water in a different pot. Add dried Somen noodles in the boiling water and gently stir noodles with chopsticks. Cook Somen noodles al dente according to your package (mine was 3 min). Drain the noodles in a strainer and rinse the noodles with hands under running water. 6. Dilute the miso (little by little) in a ladle and dissolve into the soup. Then add the Somen noodles and cook until hot. Serve in a small soup bowl or mug.